The United Nations climate change summit in Copenhagen ended in apparent disarray last night with some world leaders hailing a “meaningful agreement”, while others said no deal had been struck. The US, China, Brazil, India and South Africa claimed, after a four-hour meeting, to have secured a partial pact. But their optimism was quickly undermined by a string of more pessimistic assessments. Barack Obama, US president, acknowledged that the deal was “not sufficient to combat the threat of climate change but [was] an important first step” on cutting greenhouse gases. “We have made a meaningful and unprecedented breakthrough. For the first time in history, all of the major economies have come together to take action [on global warming],” he said after a meeting with Wen Jiabao, the Chinese premier, Manmohan Singh, India’s prime minister, Luiz Inácio Lula da Silva of Brazil and Jacob Zuma, South African president. No senior UN officials were available to comment on Mr Obama’s announcement. The agreement contained a commitment to try to hold global warming to no more than 2°C, a level scientists have suggested is probably the limit of safety, beyond which climate change could become catastrophic and irreversible. Rich countries have also included commitments to cut their emissions and developing countries to curb the growth of theirs. There were also promises to transfer money from rich to poor countries, to help them tackle climate change. But there was confusion as some countries appeared to be less optimistic than Mr Obama. While he was leaving for the airport, European officials were denying a deal. “If there had been a deal, the prime minister [of Sweden] and the president [of the Commission] would have been here. They still have not formalised the deal,” said Roberta Alenius, spokeswoman for the EU presidency. Some poorer countries made clear support was far from unanimous. Lumumba Di-Aping, Sudanese head of the G77 group of developing countries, said the US-backed plan represented the “lowest level of ambition” and would be devastating for the world’s poor. “This is an idea not a deal,” he said. His remarks raised doubts over whether a deal brokered by a small group of big industrialised and emerging economies would win the support needed to turn it into a binding treaty. One key sticking point was China’s refusal to allow monitoring of its emissions. But in a last-minute compromise, Beijing and Washington agreed to a process of “international consultation and analysis”. Brazilian representatives said negotiators would continue their work into next year in the hope of having a legally binding document that can be signed by the end of 2010. Photograph: Luciane Simões / Amigos da Terra – Amazônia Brasileira. PORTO VELHO, Brazil (Reuters) – Straddling one the Amazon’s main tributaries and flanked by dense jungle, a construction pit the size of a small town bustles with bulldozers and nearly 10,000 workers blasting huge slabs of rock off the river bank. While blue-and-yellow macaws fly overhead, a network of pipes fed by a constant flow of trucks pours enough concrete to build 37 football stadiums. The $7.7 billion (4.7 billion pound) Santo Antonio dam on the Madeira river is part of Brazil’s largest concerted development plan for the Amazon since the country’s military government cut highways through the rain forest to settle the vast region during its two-decade reign starting in 1964. In the coming years, dams, roads, gas pipelines, and power grids worth more than $30 billion will be built to tap the region’s vast raw materials, and transport its agricultural products in coming years. The Santo Antonio dam in the western Amazon’s Rondonia state, which goes online in December 2011, will pave the way for a trade route between the Atlantic and Pacific oceans by making more of the Madeira river navigable. But the behemoth project may also make it tougher for the nation to steer a new course as a leader of the global green movement. Brazil’s government says such development is needed to improve the lives of the region’s 25 million inhabitants, who remain among the poorest in Latin America’s biggest economy. With the economy expected to grow at 5-6 percent annually in coming years and the country preparing to host the 2014 soccer World Cup and 2016 Olympics, the government wants to ensure ample energy and adequate infrastructure. Critics say not all projects make economic sense and many energy-saving measures — such as switching from electric to solar water heaters — have not been explored. They also argue that the drive for development in the world’s biggest forest highlights a policy contradiction as Brazil tries to play a top role in forging a global deal on climate change at the U.N. climate summit in Copenhagen. Brazil reversed years of opposition to greenhouse gas targets this year, saying it intended to reduce Amazon deforestation by 80 percent and curb projected 2020 greenhouse gas emissions by 40 percent. “They talk about reducing deforestation and boosting controls but they invest in these mega-projects,” said Israel Vale, director at the Kaninde environmental advocacy group in Porto Velho, capital of Rondonia. “The rhetoric doesn’t fully match reality,” he said. President Luiz Inacio Lula da Silva, a pragmatic former factory worker, has acknowledged the importance of tackling climate change and the heavy contribution that destruction of the forest makes to carbon emissions. But he has consistently backed infrastructure projects in the Amazon and hits out at foreigners he says want to preserve the forest like a park, ignoring the needs of its inhabitants. “I don’t want gringos asking us to leave Amazon people to die of hunger under the canopy of a tree,” Lula said in the Amazon city Manaus in November. He says Brazil needs more international financial aid for sustainable development in the region, something he will push for in Copenhagen. New shopping malls, supermarkets and hotels reviving the decrepit centre of Porto Velho showcase the new wealth the Santo Antonio dam brings to an otherwise impoverished region. Santo Antonio Energia, the consortium building and operating the dam, is made up of Brazilian power and construction companies, a pension fund, as well as domestic and foreign banks. The investment boom has helped many people get their first job with proper benefits. “The people who want to protect the forest have never been hungry or needy,” said Antonia Meyrilen, a 27-year-old mother training to be a carpenter. Porto Velho is not new to boom and bust cycles, previously driven by rubber, gold, and timber. The town of Jaci-Parana, halfway between Santo Antonio and a second dam similar in size being built further upstream on the Madeira, shows how wealth doesn’t always equal progress. Aside from the pick-up trucks with company logos, the scene is reminiscent of a Wild West boom town during the California gold rush. Bars and brothels hammered together overnight with rough-cut boards line the muddy main strip, with pool tables and prostitutes luring customers. Jukeboxes and video games blare into the night and swinging doors reveal back-parlour gambling. Talk abounds that landowners have hired a gunman to kill tenants who could otherwise claim part of their compensation for houses that will be flooded by the dam. “Our town’s been turned upside down,” said Irene Nascimento, 47, who runs a bar and convenience store. “The price of land trebled in a few months, everything is expensive — some people gain, others lose,” she said. Santo Antonio Energia has donated millions of dollars to philanthropic projects, including blackboards and computers for schools, the revival of an old railway and the installation of a much-needed sewage system in Porto Velho. When the dam is complete, most jobs related to the project will go and financial benefits will be limited to tax payments to public coffers, raising the risk that boom may again turn to bust. “If the residents here don’t keep watch and define the public policies they want, they won’t get much out of this,” said Ricardo Alves, head of sustainable development at Santo Antonio Energia. Santo Antonio and most of the other 10 dams on the drawing board for the Amazon region require a much smaller water reservoir than older dams did and therefore flood a far smaller area per unit of generated energy. The company says it is minimizing environmental impact by treating sewage from the construction site, combating malaria, and relocating affected flora and fauna. It also donated trucks and equipment to government environmental services. Still, on both sides of the river as many as 1,000 families will see their homes flooded and their cemeteries moved. Indians and fishermen fear the land they hunt on and the river they fish in won’t be the same. The roughly 200 families that agreed to move to a model housing project with running water, electricity, and an already planted vegetable garden are mostly content. Several of the others prefer their simple but familiar surroundings — often wood shacks with no amenities. “We have no choice. They want to pull us out, so they have to pay,” said Leonardo Fonseca da Cruz, a 63 year-old fisherman who lives along the picturesque Teotonio rapids. His neighbours said the Santo Antonio consortium was offering too little to compensate for lost revenue from fishing. Company officials admit they don’t know how many fish species will be made extinct or what impact a growing population will have on the environment. “In order to build a dam, you need to move the river. Of course, it’s going to have an impact,” said Antonio Cardilli, Santo Antonio Energia’s head of employee training. “There are people in society who want to eat an omelette without breaking the eggs,” he adds. Throughout the world hydro energy is still an attractive option because it is much cheaper than nuclear or fossil fuel-fired power plants. New technologies, accumulated experiences, and heightened awareness have eased but not eliminated the social and environmental risks in building dams, says Carlos Tucci, who has advised the United Nations, World Bank and others on dam construction for 40 years. “We have the ability to create better projects today but there is always an inevitable local impact and there are still other risks — design or implementation problems, unforeseen changes in water flow,” said Tucci. A series of dams on Brazil’s Sao Francisco river and an unexpected change in water volume caused sedimentation problems that led to dramatic algae growth and a 50 percent reduction in fish stock, said Tucci. 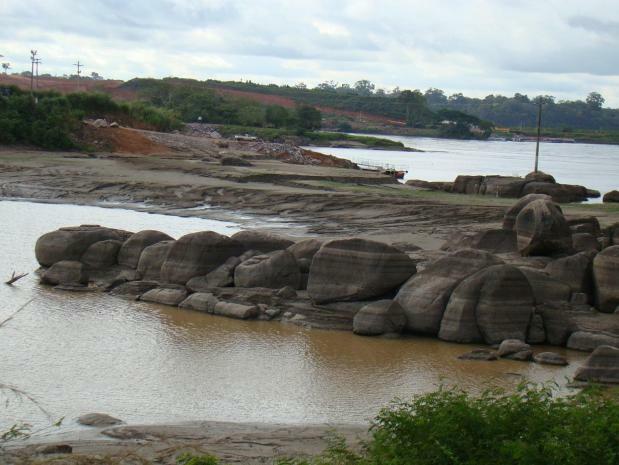 At Santo Antonio, a different dam design and water quality should avoid such problems, though the impact of heavy sedimentation accumulation is uncertain, said Tucci, adding that the company’s original sedimentation and hydrology impact study was poor. Critics say the government pressured the environmental protection agency Ibama into rubber-stamping the environmental licence in 2007 and waived the need for certain impact studies. At the time, two Ibama officials resigned over the standoff. “The government used political and not technical criteria,” said Roberto Smeraldi, head of Friends of the Earth in Brazil, which sued Ibama for allegedly breaking environmental law in the licensing process. Leaders of native Indians living on nearby reservations are sceptical, saying government development projects usually make life worse for them. “The arrival of the white man, the road, the time they threw chickens at us and said it was a farming project to ensure us income — are we better off today?” asked Antenur Caritiana, of the Caritiana tribe. He is concerned that rising water levels of tributaries will flood bridges and roads, and that their women will be drawn to prostitution as their lands are invaded by loggers and wildcat miners. Most Indians in his jungle town understand little of the dams and their potential impact, despite company briefings. But according to village elder Delgado Caritiana, they won’t object if given education, health and farm aid. “The main concern is the problem of monitoring and protecting Indian lands,” said Santo Antonio’s Alves. Forest guards are to help protect reservations but Indians don’t trust the government Indian foundation Funai, which negotiates with Santo Antonio Energia on their behalf. “The Funai doesn’t listen to us, they bring their projects ready-made from the capital,” said Antenur. The number of Indians over the last two decades has more than doubled to nearly 1 million, out of Brazil’s population of 195 million people. Their lands account for 12 percent of Brazil’s territory. But whether on a spacious reservation in the Amazon or cramped on ghetto-like reserves in the south, most of their land is under pressure from ranchers, loggers, wildcat miners, or power and construction companies. Such challenges are likely to be multiplied with the planned construction of the much larger Belo Monte dam on the upper Xingu river. The region is home to numerous Indian tribes and the dam would directly impact 120,000 people. The environmental agency Ibama is again under pressure, this time to speed up the Belo Monte approval process. Again, two officials resigned and conservationists cried foul. 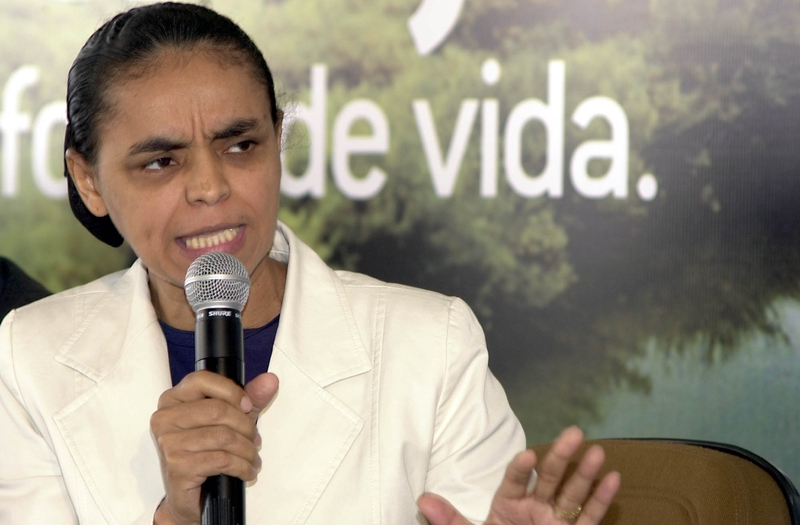 “They want them to turn a blind eye to technical and legal procedures, and sometimes even to ethics,” said Marina Silva, former environment minister and renowned Amazon defender. Perhaps the biggest worry for environmentalists is the planned pavement of the BR 319 motorway between Porto Velho and Manaus, which leads through one of the most pristine areas of the Amazon with a high biodiversity and many endemic species. Deforestation of the Amazon has fallen to the lowest rate in over two decades, due in part to stepped up controls on illegal ranching and logging but also to weaker global demand for farm products from the region, such as beef, soy and timber. Still, nearly 20 percent of the Amazon has already disappeared and large chunks of the forest are still destroyed every year. In the year through July 2009 an area the size of the U.S. state of Delaware was chopped down. Supporters of the road say it would reduce the cost of merchandise in Manaus but studies show transportation costs to and from Manaus are cheaper by river than road. Jorge Viana, former governor of the Amazon state Acre and a leading voice in Lula’s Workers’ Party last month sent a letter to Lula along with a group of prominent scholars saying there was “no economic justification that can compensate for the environmental cost” of the road. The government pledges to create new national parks to buffer the environmental impact of the road but experts point to numerous parks in the region that have been invaded by ranchers and loggers. “The road makes no sense. We are not against development and infrastructure but it needs to be intelligent,” said Paulo Moutinho, coordinator at the independent Amazon research Institute, Ipam. He said projects like the road could fuel deforestation, which makes up 75 percent of Brazil’s carbon emissions. COPENHAGEN (Reuters) – China led calls by developing nations for deeper emissions cuts from the United States, Japan and Europe at U.N. climate talks on Tuesday, as a study showed that this decade will be the warmest on record. The first decade of this century was the hottest since records began, the World Meteorological Organisation said, underscoring the threat scientists say the planet faces from rising temperatures. Negotiators from nearly 200 countries are trying to seal the outlines of a climate pact to combat rising seas, desertification, floods and cyclones that could devastate economies and ruin the livelihoods of millions of people. Yvo de Boer, head of the U.N. Climate Change Secretariat, said the Dec 7-18 talks in Copenhagen were “off to a good start.” The EU said it was positive that no one had walked out of negotiation sessions. But a rich-poor rift continued to cloud negotiations on finance and emissions cuts. Recession-hit rich countries have not yet made concrete offers to aid developing nations who also want the industrialised world to act faster to curb emissions. China and many other developing nations urged the rich to make deeper cuts in emissions and Beijing scoffed at a fast-start fund of $10 billion (£6.1 billion) a year meant to help developing countries from 2010 that rich countries are expected to approve. China, the world’s biggest emitter of greenhouse gases, criticised goals set by the United States, the European Union and Japan for cuts in greenhouse gas emissions by 2020. Su Wei, a senior Chinese climate official at U.N. climate talks in Copenhagen, said the targets broadly fell short of the emissions cuts recommended by a U.N. panel of scientists. The panel has said cuts of 25 to 40 percent below 1990 levels by 2020 were needed to avoid the worst of global warming. He said a U.S. offer, equal to 3 percent below 1990 levels by 2020, “cannot be regarded as remarkable or notable.” An EU cut of 20 percent was also not enough and Japan was setting impossible conditions on its offer of a 25 percent cut by 2020. “This $10 billion if divided by the world population, it is less than $2 per person,” he said, adding it was not even enough to buy a cup of coffee in Copenhagen or a coffin in poorer parts of the world. “Climate change is a matter of life and death,” he said. Brazil’s climate change ambassador said his country did not want to sign up for a long-term goal of halving global emissions by 2050 unless rich nations took on firm shorter-term targets — which the Danish hosts view as a core outcome for the talks. Copenhagen was meant to seal a legally binding climate deal to broaden the fight against climate change by expanding or replacing the Kyoto Protocol from 2013. While that now looks out of reach, host Denmark wants leaders to at least agree on a “politically binding” deal. The Danish government has said this would be 5 to 8 pages with annexes from all countries describing pledged actions. Negotiators are also trying to whittle down almost 200 pages of draft text that is expected to form the basis of an eventual post-2012 climate treaty. While negotiators have made progress refining the text, it is still full of blanks and options. 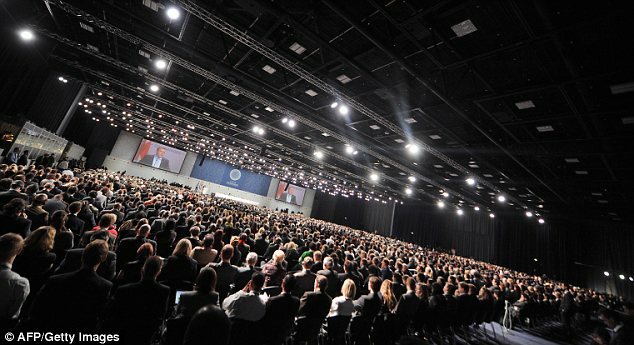 African civil groups led a protest inside the main conference centre in Copenhagen, urging more aid to prepare for global warming. “Africans are suffering. We will not die in silence,” said Augustine Njamnshi of Christian Aid. A draft 9-page Danish text with annexes seen by Reuters last week drew criticism by environmental activists, who said it undermined the negotiations. “Focus on the Danish text right now is a distraction from the negotiations,” said Kim Carstensen, head of conservation group WWF’s global climate initiative, adding the text did not lay out what would happen to the Kyoto Protocol. He called the Danish text a weak attempt to accommodate the United States. De Boer described the text as an informal paper for the purposes of consultation and not an official part of the negotiations. Much is riding on what U.S. President Barack Obama can bring to the table in Copenhagen when he joins more than 100 other world leaders during a high-level summit on Dec 17-18. Washington’s provisional offer is to cut emissions by 17 percent by 2020 from 2005 levels, or 3 percent below the U.N.’s 1990 baseline. The U.S. Environmental Protection Agency ruled on Monday that greenhouse gases endanger human health, allowing it to regulate them without legislation from the Senate, where a bill to cut U.S. emissions by 2020 is stalled. Delegates cautiously welcomed the step as a boost for Obama. With the scientific consensus more or less settled that human activity — the burning of fossil fuels, torching of forests, and so forth — is contributing to a warmer and less hospitable planet, one might reasonably ask, why is it so hard to agree on a plan to curb those activities? The answer lies with the many fault lines that cut through the debate over climate change. Those deep divisions will be on display beginning this week as representatives of 192 nations gather in Copenhagen for a United Nations conference on the issue. Organizers had hoped to emerge with an international compact to reduce greenhouse gas emissions and help countries most threatened by rising sea waters and temperatures. But the divisions between nations are such that world leaders agreed last month to put off resolving the most contentious issues until next year. They will try instead to reach a nonbinding interim agreement in Copenhagen, then work toward a binding treaty in 2010.
Who should pay whom for what — and how much? The Bolivias and Chads and Mauritanias of the world argue that they are more vulnerable to changes in temperature, and have little or no resources to adapt to changes in the growing seasons or increased rainfall or — worst case — to relocate large numbers of people. They want the rich world to commit to far deeper emissions cuts than they already have, and to provide them with cash and technology so they can prepare for the worst and develop a clean energy infrastructure for themselves. The rich world, meanwhile, is busy trying to figure out just how to calculate the cost of all this (estimates run into the trillions of dollars), and how to divvy up the bill. This is where postindustrial economies like the United States and Europe, which became prosperous by burning carbon-dioxide-spewing fossil fuels, face off against industrializing economies like China, Brazil and India, which resent pressure to decarbonize their energy systems now that they are growing. The standoff between China and the United States underscores the issues. The global trade rivals were reluctant to commit to emissions targets until each had an idea of what the other planned. The two countries together are responsible for 40 percent of the world’s greenhouse gas emissions. But all players have been eyeing each other warily. In recent weeks, bidding has begun, with Brazil, then the United States, followed by China and, last week, India, offering up individual emissions goals. But they have used different baselines against which to measure their reductions, making it difficult to determine whether there is parity. In mid-October, ministers of the government of the Maldives, a low-lying island nation in the Indian Ocean, donned scuba gear and held a 30-minute cabinet meeting underwater off the coast of the capital, Malé. The stunt was designed to highlight the nation’s plight — and that of three-dozen or so other small island and coastal countries — should global warming raise sea levels in the coming decades. Even a modest increase could leave a number of low-lying nations uninhabitable. As a bloc, these countries have been lobbying for an international agreement to keep average temperatures from rising beyond 1.5 degrees Celsius — or 2.7 degrees Fahrenheit. They also want global emissions scaled back by as much as 85 percent by midcentury. The bloc, which includes a wide range of economies, from relatively well-to-do Singapore to strugglers like Haiti, wins points for being at the front lines of a planetary problem, but its political clout at the negotiating table is uncertain. Even though the European Union has been at the vanguard of renewable energy development and emissions reduction through its carbon trading scheme, it is struggling internally over each nation’s carbon quotas, assistance to developing countries and fidelity to the emissions reductions agreed to in 1997 under the Kyoto Protocol. While Europe as a whole is on track to meet its goal of an 8 percent reduction over 1990 emissions levels by 2012, not every country has pulled its weight. Nations unlikely to meet their individual Kyoto targets include Italy, Spain and, yes, Denmark, host of the Copenhagen talks. Poland and Estonia, meanwhile, have been bickering with the European Commission over the amount of carbon dioxide the two countries should be allowed to emit. Both rely heavily on coal for electricity. Oil-producing nations are worried about the impact of a global climate deal, and they have increasingly argued that any agreement that would reduce reliance on fossil fuels should include compensation for their lost revenues. Saudi Arabia has spearheaded this argument, and while environmental groups and other stakeholders have dismissed the notion as a stunt, oil producers are not without the ability to muddle negotiations if push comes to shove. Meanwhile, developers of wind, solar and other renewable technologies anticipate a windfall if the community of nations — including mega-polluters like the United States — agree to a binding climate treaty. So, too, do global banks, which would presumably do handsomely through an expanded carbon trading market. Lobbyists from all sides will be wining and dining delegates over the next two weeks. Many experts argue that the only way to tackle climate change is to put a price on carbon. Some say the best way to do that is to create a cap-and-trade system, in which industries are issued permits to emit carbon dioxide up to a certain level, or cap. Companies that emit below the cap can then sell their permits on a carbon market, where companies exceeding the cap will, presumably, buy them so they can continue to pollute. The total number of permits would not exceed an overall emissions target. Europe has had an emissions trading scheme since 2005. Some critics argue, however, that such systems are unnecessarily complicated and prone to manipulation. A simpler solution would be a tax on carbon, they say. But with a cap-and-trade scheme forming the bedrock of negotiations in Copenhagen, and among legislators in Congress seeking to pass national climate legislation, the carbon-tax camp has been increasingly marginalized. The idea that human beings are nudging the planet’s thermostat upward is widely accepted among climatologists. But just how rapidly things are changing, to what extent and where — and at what threshold, if any, should we abandon all hope — are far less settled questions. In 2008, the NASA scientist and global warming guru James Hansen identified 350 parts per million as the upper limit for safe atmospheric carbon concentration. Current levels are approaching 390 parts per million. Others argue that there is no reason for panic — nor for what they say is an economy-crushing global climate treaty. They are putting their faith in human ingenuity, arguing that planetary-scale engineering projects like blasting seawater into the atmosphere to increase the heat reflectivity of certain clouds (yes, that’s a real idea), will eventually solve the problem. By offering concrete emission targets last week, the United States and China have resuscitated global climate talks that were headed toward an impasse. But the details that have yet to be resolved — including the money that industrialized countries would offer poorer ones as part of an agreement — suggest a political deal remains a heavy lift for the 192 countries set to convene in Copenhagen in little more than a week. Negotiators aim to produce a blueprint for a legally binding international treaty that would replace the Kyoto Protocol when it expires in 2012 and govern individual countries’ greenhouse gas emissions. Although the proposals from the world’s two biggest greenhouse-gas emitters have boosted the prospects for a deal, they demonstrate something else as well: No one wants to shoulder the blame for failure at Copenhagen, even if it means the final outcome falls short of what many had envisioned a year or two ago. The U.S. pledge to cut its emissions by 2020 and China’s offer to lower its carbon dioxide output relative to the size of its economy by the same date are more modest than what their negotiating partners had demanded. The fact that countries are defining their climate goals in varied ways — including different baseline years and efficiency targets rather than absolute cuts — makes it hard to assess their commitments. The United States has pledged cuts that are modest in the first decade but ambitious 15 and 20 years from now, while China has set a target that could amount to a meaningful reduction if the country’s growth rate slows somewhat. The biggest remaining obstacle is money, including how much the developed world will give developing nations to cope with the impact of global warming and to acquire technology to curb their emissions. The United States has not said how much it would pay into any global fund, which the Europeans have estimated would require at least $10 billion annually beginning next year. And on Thursday, Brazilian President Luiz Inácio Lula da Silva said at a meeting of Amazon nations that wealthier countries must “pay the price” for protecting rain forests that are vulnerable to clear-cutting and burning by farmers and ranchers, activities that help fuel global warming. Connie Hedegaard, the Danish minister for the climate conference, said “the decision on finance” was the most pressing issue developed countries face. The Obama administration has allocated about $1.2 billion toward international climate programs as part of its proposed fiscal 2010 budget. Sen. John F. Kerry (D-Mass. ), chairman of the Foreign Relations Committee, said in an interview that it would take at least twice as much to help seal a deal in Copenhagen. China’s announcement Thursday that it would send Premier Wen Jiabao to the talks and improve its economy’s energy efficiency — by as much as 45 percent by 2020, compared with 2005 levels — makes it easier for other countries to commit to a treaty, but it remains unclear how the outside world would verify these cuts. “It’s great the Chinese have come forward with a plan, but are they willing to have that part of a binding agreement?” said Stephen Eule, vice president for climate and technology at the U.S. Chamber of Commerce’s Energy Institute. Several U.S. senators have said they cannot endorse domestic climate legislation or an international treaty unless it ensures that such economic competitors as China and India will take steps to curb their carbon dioxide output. Daniel Price, an international economics adviser on the climate talks under former president George W. Bush, said negotiators still must resolve a range of issues, such as protecting the intellectual property rights of technological innovators and ensuring the integrity of any carbon trading scheme created under the pact. The need for consensus under the United Nations Framework Convention on Climate Change, which governs the talks, offers further complications. A bloc of African nations agreed this month on their bottom line for any deal but have not disclosed it. Major developing countries such as China, India and Brazil say they, too, will offer a unified position at the negotiations, but they have yet to determine it. Dominick DellaSala, president of the National Center for Conservation Science and Policy, said the emerging compromise could prompt negotiators to “lock in” less ambitious emission targets in the short term. Even Hedegaard, the Danish minister, noted that the current climate pledges by developing countries amount to an 18 percent reduction below 1990 emission levels by 2020, but the United States is pledging to cut emissions by about 4 percent by then. Europeans and many scientists have called for a 25 to 40 percent cut. Cutting a political deal now, argued Hedegaard and environmental advocates such as Chatterjee, makes more sense than holding out for a perfect agreement. Speaking before Amazon summit, Lula calls on industrialised countries to provide financial help to halt deforestation. Brazil’s president said today that “gringos” should pay Amazon nations to prevent deforestation, insisting rich western countries had caused much more environmental destruction than the loggers and farmers who cut and burn trees in the world’s largest tropical rainforest. 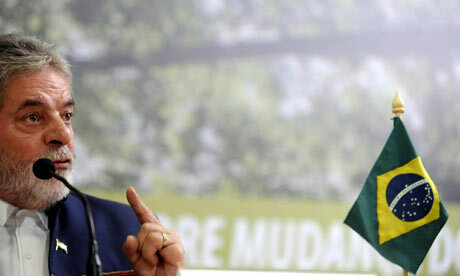 President Luiz Inácio Lula da Silva was speaking before an Amazon summit at which delegates signed a declaration calling for financial help from the industrialised world to halt deforestation, which contributes to global warming. In Brazil, the word “gringo” generally refers to anyone from the northern hemisphere. Lula convened the meeting to form a unified position on deforestation and climate change for seven Amazon countries before the Copenhagen climate summit. But the only leaders who attended were Guyana’s Bharrat Jagdeo and France’s Nicolas Sarkozy, representing French Guiana, leaving top Lula aides and environmentalists to admit the gathering will have a muted impact. Other countries sent vice-presidents or ministers, and the presidents of Colombia and Venezuela embarrassed Brazil by cancelling at the last minute. Sarkozy supported a recent proposal by Lula to create a financial transaction tax that would be used to build a fund to help developing countries protect their forests. Details will be discussed in Copenhagen. Despite the lacklustre summit showing, Lula aides said it was important to drive home a message that the Amazon is home to 30 million people, most of whom depend on the forest’s natural riches to eke out a living. About 25 million live in Brazil’s portion. Brazil has managed to reduce Amazon destruction to about 7,000 square kilometres a year, the lowest level in decades. But that is still larger than the US state of Delaware. The Brazilian Amazon is arguably the world’s biggest natural defence against global warming, acting as an absorber of carbon dioxide. But it is also a big contributor to warming because about 75% of Brazil’s emissions come from rainforest clearing, as vegetation burns and felled trees rot. Brazil has an incentive to protect the Amazon because the new global climate agreement is expected to reward countries for “avoided deforestation” with cash or credits that can be traded on the global carbon market. Norway will give Brazil $1bn (£600m) by 2015 to preserve the Amazon rainforest, as long as Latin America’s largest country keeps trying to stop deforestation. Norway was the first to supply cash to an Amazon preservation fund which Brazilian officials hope will raise $21bn to protect nature reserves, persuade loggers and farmers to stop destroying trees, and finance scientific and technological projects. Brazilian environment minister Carlos Minc has said Japan, Sweden, Germany, South Korea and Switzerland are considering donating to the fund. What inspired you to do environmental work? It was a combination of things. First, the sensibility I gained from living with the forest, from being born there and taking my sustenance from it until I was 16 years old. 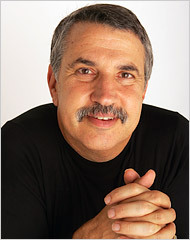 Second was my contact with liberation theology, with people like Chico Mendes, a connection that raised social and political consciousness about the actions of the Amazonian rubber-tappers and Indians who were being driven out of their lands because the old rubber estates were being sold into cattle ranches. These encounters made me become engaged with the struggle in defense of the forest. Later, I discovered that this was about “the environment” and the protection of ecosystems. It was an ethical commitment that these natural resources could not be simply destroyed. How does your Amazon upbringing affect the way you see the issues at stake? Without doubt, the experience of living in one of the most biologically and culturally diverse regions of the world has affected how I see the world. I see two time frames: forest time and city time. Forest time is slower; things have to be more fully processed; information takes a long time to get there, so people didn’t have access to new information. When a new idea arrived, you thought about it, elaborated on it, talked about it for a long time. So this way of thinking, reflecting on and developing ideas, helps me have a sense of the preservation of things, to not make rushed decisions. In your view, how is the international community responding to climate change? We are already extremely close, in terms of the maximum of what is permissible in emissions. It’s an effort that both developing and developed countries have to make. What has been agreed to so far in the meetings leading up to Copenhagen is not terribly promising. Society has to reflect this kind of urgency to leaders, and leaders need to assume responsibility for taking on the issue, not only in terms of present interests but in terms of future interests. What they would like to do, or what they would feel comfortable to do with the short-term time horizons of their mandates, is not enough. To what extent do you think avoided deforestation in places like the Amazon can succeed at curbing global warming, given that deforestation accounts for 15 percent of the world’s annual greenhouse gas emissions? For this process to last, to be sustainable over time, we need to change the process of development. It’s not enough to say what people can’t do. You have to tell them what they can do, how they can do it and provide them with the means to do it. In the case of the Amazon, there are 25 million people living there, and they need alternatives. If there are not alternatives, there will once again be tremendous pressure on the forest. What’s needed is a change in the fundamental economics of the Amazon to create sustainable expectations to meet the needs of the people. How do you view the United States’ current work on climate change? We’re enthusiastic about what’s going on in the United States, the fact that there’s been a law passed by the House of Representatives. The fact that climate-change legislation is on the agenda of the United States is tremendously important. It’s a huge change, after being absent from the international negotiations for nearly 10 years, that the United States has returned. I recognize that the United States not having legislation [passed] in the Senate creates a problem. At the same time, the sentiment of the international community is going to demand that these [industrialized] countries take on a long-term target, an 80 percent reduction in emissions by midcentury. It’s important that there’s agreement around a long-term target. President Obama and the Congress are beginning a discussion that should have happened 10 years ago. But the fact that it has begun is very promising. How optimistic are you that the world’s nations will take on binding commitments to curb greenhouse gas emissions? We already have the greater part of the technical responses that we need to address these problems. What we need to do is to put these technical responses and methods at the service of ethics, and take into consideration the fate of future generations. Do you still live in the Amazon part of the time? In my mind, I’m always in the Amazon. I just have a job that requires me to work in Brasilia for a certain time. I’m increasingly called upon to travel to other states in Brazil and outside of Brazil, but my reference point is Amazonia; it’s the locus from which I enter into dialogue with other regions of Brazil and the outside world. I make a point of returning to the Amazon at least once a month. What was it like working with Chico Mendes? What might he make of Brazil’s and the world’s efforts on the environment today? I worked and lived with Chico Mendes. It was sharing friendship and apprenticeship. It was principally a political apprenticeship, not in the sense of party politics, but the politics of how to relate to different parts of society, in this case the rubber-tappers. Chico Mendes had an enormous capacity for dialogue — even with those who were against him, who opposed him in the extreme — and to not let himself be intimidated by the seeming impossibility of dialogue. He didn’t allow other people’s indifference to influence him. Even if someone was indifferent to his cause, this didn’t mean he had to be indifferent to them. I learned that first we should count on relationships, on persuasion rather than conflict, on processes of co-authorship. With regard to the efforts Brazil and the world have made on environmental issues, if Chico were alive he would agree that they are far beyond the times he experienced, when he had to confront the fury of those who wanted to do the same thing in the Amazon as was done in Brazil’s Atlantic forest and other Brazilian biomes. But he would also certainly conclude that these efforts are much less than the planet needs. EPA Brazil will hold its first wind-only energy auction next month in a move to diversify its energy portfolio. Foreign companies are scrambling to take part. Early this decade, a drought in Brazil that cut water to the country’s hydroelectric dams prompted severe energy shortages. The crisis, which ravaged the country’s economy and led to electricity rationing, underscored Brazil’s pressing need to diversify away from water power. One result of that introspection will climax on Dec. 14, when the Brazilian government conducts its first wind-only energy auction. The bidding is expected to lead to the construction of two gigawatts of wind production with an investment of about $6 billion over the next two years. The auction has attracted a number of international players, including the local units of Energias de Portugal, Electricité de France, Spain’s Iberdrola, EnerFin of the United States and several Brazilian companies, among others. Interest has been so great, in fact, that the Ministry of Mines and Energy, which is conducting the auction, postponed it by three weeks to allow extra time to evaluate the preliminary bids. “The number of projects proposed were much greater than expected by everyone,’’ said Pedro Perrelli, the executive director of ABEEólica, the Brazilian Wind Energy Association. Industry and the government had anticipated proposals for 4.5 gigawatts to 6 gigawatts of projects, but “we came to the astonishing number of 13.3 gigawatts’’ from 441 proposals, Mr. Perrelli said. Within days, the government plans to release the auction’s technical manual, allowing participants to refine their bids. The winners will get a 20-year power-purchase agreement from the state. Brazil counts on hydroelectricity for more than three-quarters of its electricity, but authorities are pushing biomass and wind as primary alternatives. Wind energy’s greatest potential in Brazil is during the dry season, so it is considered a hedge against low rainfall and the geographical spread of existing hydro resources. Mr. Mello said Brazil’s technical potential for wind energy is 143 gigawatts due to the country’s blustery 4,600-mile coastline, where most projects are based. 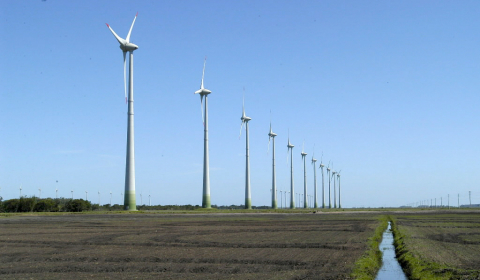 The Brazilian Wind Energy Association and the government have set a goal of achieving 10 gigawatts of wind energy capacity by 2020 from the current 605 megawatts, with another 450 megawatts under construction, said Mr. Perrelli. The industry hopes the auction will help kick-start the wind-energy sector, which already accounts for 70 percent of the total in all of Latin America. Brazil is already a renewable energy leader in the field of ethanol. Hydropower’s growth is increasingly held up over environmental concerns. And growing concerns about Brazil’s deforestation, the effects of climate change and pressure to reduce the country’s carbon emissions also work in wind’s favor. But Keith Hays, the research director for wind energy at the Cambridge, Mass.-based Emerging Energy Research, a consultant firm to companies on renewable energy, said that uncertainty surrounding the financing and profitability of wind projects in Brazil raises doubts over whether the country can reach its goals. He attributed the widespread interest in the wind auction to a desire among foreign companies to gain a foothold in Brazil, which is Latin America’s biggest market. But Mr. Hays said that the lack of a floor on the price the government will pay for energy — as is customary in European countries that are leaders in wind energy, like Germany and Spain — could limit the industry’s growth because the winning projects may prove to be unprofitable. “Their track record doesn’t speak to a huge success,’’ Mr. Hays said. Belem, Brazil – “One million dollars?” The question was asked with eyes wide and a voice of incredulity. The person asking was Antonio Waldez Góes da Silva, the governor of the Amazonian state of Amapá, which has the biggest national park in the world. I had just shared with Gov. Waldez Góes a recent news article in The Hill, the Congressional newspaper, which said the total cost of stationing one U.S. soldier in Afghanistan for one year is $1 million. What if we kept just one soldier back from Afghanistan and gave you the money, I asked the governor? What would it buy you? Gov. Waldez Góes mulled that over: “If you kept three soldiers back, that would be enough for me to keep the State University of Amapá running for one year, so 1,400 students could take different courses on sustainable development for the Amazon.” O.K., I know. It is a bit misleading to take a war budget and assume that if it weren’t spent on combat, it would all go to schools or parks. And we do have real enemies. Some wars have to be fought, no matter the cost. But such comparisons are still a useful reminder that our debate about Afghanistan is not taking place in a vacuum. We will have to make trade-offs, and there are other hugely important projects today crying out for funding, as my colleague Nick Kristof has pointed out regarding health care. Well, if America is going to assume the primary burden of fixing Central Asia, maybe, say, China, could help pick up the tab for saving what is left of the Amazon and the world’s other great tropical forests. Could President Obama raise that idea in Beijing? An intergovernmental working group for saving the rainforests estimates that for about $30 billion we could reduce deforestation in places like Brazil, Indonesia and the Congo by 25 percent by 2015. After that, financing from global carbon markets, plus these countries’ own resources, could save much of the rest. China now has $2.2 trillion in reserves. How about it, Beijing? Why don’t you step up and provide some public goods for the world for once — not because you get a direct benefit, but just because it would make the world a better place for everyone? Sure, America should still lead such efforts. But China’s days as a global free-rider should be over. China should pay its fair share — and more — since it will benefit every bit as much as the U.S., Europe and Japan. Indeed, the U.N. Foundation estimates that because living tropical forests are such huge storehouses of carbon — which gets released when we chop the trees down — if we just stop deforestation, we get a big chunk of the carbon-emissions reductions the world needs between now and 2020. “And forest-rich developing countries, like Brazil, are now ready to do their part because they depend on the water that the rainforests provide for energy and agriculture, and because they see a new model for growth based on their natural capital,” said Glenn Prickett, a senior vice president with Conservation International and my traveling companion here. 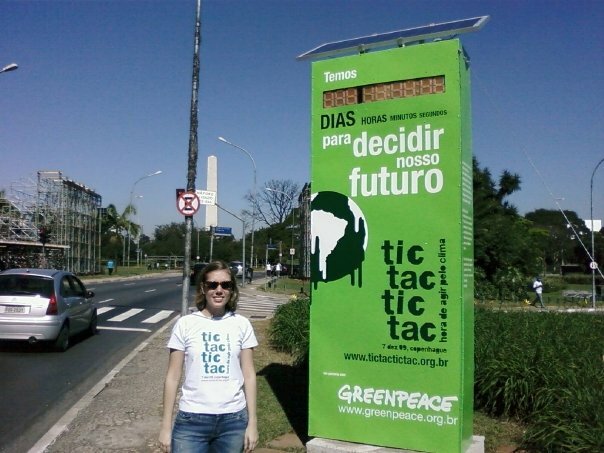 “Brazil has developed the science, political will and basic rules and institutions for preserving its rainforests. What Brazil and other rainforest nations like Indonesia lack, though, are the funds to take this new economic model to scale.” I was struck by how many of the building blocks for “natural capitalism” that Gov. Waldez Góes — whose state sits at the mouth of the Amazon — is putting in place, so that he can have an economy based on preserving the rainforest rather than stripping it. He’s building on the three P’s — creating protected forest areas, improving productivity on lands that have already been cleared so farmers there will not need more, and establishing property rights for Amazonian lands, which are a legal mess, inviting Wild West land grabs and scaring off investors in sustainable agriculture. Gov. Waldez Góes has already protected 75 percent of his state as rainforest and has enacted the laws and created a technical college to provide for sustainable logging and eco-tourism and for developing medicinal and cosmetic products from rainforest plants. But he needs funds to implement and monitor at scale and prove that “natural capitalism” can deliver more than the extractive version. “I am the son of a rubber tapper,” he explains. “I was born and raised in the jungle, so even before becoming a politician I had a strong connection to nature.” The world is facing this relentless “development path that brings pollution and degradation and deforestation,” he added. He and other Brazilians want to prove you can do better by bringing “conservation and development together.” Tropical forests represent some 5 percent of the earth’s surface but harbor 50 percent of all living species. Conservation International has a motto: “What is lost there is felt here.” If we lose what is left of the Amazon, we’ll all feel the climate effects, changing rainfall and loss of biodiversity that enriches our world. Brazil seems ready to do its part. Are we? What about you, China?